Samuel T. David grew up in Stoughton Wisconsin, a small town just south of Madison. Sam received his BS in Biology from University of Wisconsin-La Crosse. He then worked for three years doing habitat restoration and wildlife management on Fort McCoy military base before returning to UW-La Crosse. While in grad school he continues to work summers on Fort McCoy doing vegetation monitoring. He received his Master of Science in Biology in May 2017. With a thesis titled, Species composition and abundance of endorrhizal fungi in Carex pensylvanica from sand prairies. At UW-La Crosse, Sam worked with Tom Volk and Todd Osmundson. Sam’s research identified and measured colonization of the fungi found on the roots of Carex pensylvanica and looked at different environmental factors that may influence the plant-fungal interaction. Although C. pensylvanica grows from Iowa to Nova Scotia in a variety of habitats, Sam specifically investigated sand prairies because these are endangered habitats native to Wisconsin and the fungi in these habitats are not well understood. From UWL, Sam received an RSEL grant to complete his research and a Travel Award to give an invited talk at the 2016 Radical Mycology Convergence about endophytes as an emerging area for fungal research and applications. He also volunteers time to survey and generate fungal species lists for local natural areas managed by a non-for-profit organization. In the future Sam hopes to find an interesting career, that is a mix of natural resource management, education and art. How did you become a mycologist? Like a hyphal tip, I grew into it…my high school science teacher, Jack Palmer, first taught me about mycorrhizae and sparked an interest. Going through a skater-punk adolescence, I was interested in things that are all around us and important, but most people don’t know about or understand, like fungi. With some fungal guidance, I decided I wanted to go to school for biology. While in biology at UW-La Crosse, I took Mycology with Tom Volk and became hooked. That’s when I heard the John Rippon quote, “Mycology is an exercise in contemplative observation,” and knew it was for me. I continued to identify, pick and eat mushrooms while working in natural resources and became known as “the mushroom guy” to my co-workers. After a few years, I happened to go on a foray with the newly formed UWL Mycology club and ran into Tom again. He encouraged me to go to grad school, so I applied, got in and ran with it. Who is your mycology role model? What is your favorite mushroom/fungus, and what do you like about it? Amanita virosa for the taste. What is your favorite thing about mushrooms? The thrill of finding choice edibles in the woods and sharing that feeling with friends. Do you have any funny or interesting stories about field work? I worked with inmate crews one summer and it was a little intimidating because there were no guards present when we worked in fields. Some of the guys were big and looked tough, but then it all changed when I heard a few of them scream like little girls when they almost touched a spider. Working on a military base is always interesting because you don’t know what you will see or find. You can be looking at rare wildflowers with helicopters carrying Humvees flying over and assault rifles going off in the distance. I have also found several unexploded ordinances including various bombs and a tank round from WWII training. We did prescribed burns in places where there were left over ammunition that started to go off. It is scary at first, but the majority are blanks and even real bullets don’t shoot out much unless out of a barrel. One time I was walking through 8ft tall hazel brush and almost walked into a black bear. Luckily I sounded big so it ran off just before I got to it. What do you like to do in your free time? What are your hobbies? I like to play music with friends. I play guitar mostly, but also know bass and ukulele. Other than music, I hike, camp, rock climb, canoe, snowboard, long board, rollerblade, disc golf, hunt, fish, forage, and drink beer. I was a ceramics minor and owned and operated a little pottery business until I was too busy in grad school, but want to get back into it. He is originally from Colombia, and I grew up in small town outside of Bogotá. Alejandro received his B.Sc. Microbiology (Minor in Chemistry) from Los Andes University, in Bogotá, Colombia in 2005. He also earned a M.Sc from Los Andes University, his thesis title was Isoenzymatic characterization of proteases, amylases and partial purification of proteases from filamentous fungi causing biodeterioration of industrial paper. The aim of that research was to characterize the diversity of fungi growing on early 1900’s documents and characterize the enzymatic activities of these fungi, and to establish isolates with a bioprospective potential to be use for the production of enzymes. Alejandro than traveled to Michigan State Univeristy, where he received a second M.Sc. working on Phenotypic and genotypic characterization of Phytophthora infestans isolates from Michigan and tuber late blight development. He used different plant and in vitro assays to characterize phenotype of P. infestans in conjunction with SSRs. Aljeandro earned his Ph.D in Plant Pathology and Ecology, Evolutionary Biology and Behavior from MSU in 2016, working with Dr. Martin Chilvers. His dissertation was titled, Diversity of oomycetes associated with soybean seedling diseases. The aim of that research was to characterize oomycete communities associated with soybean seedlings using culture and amplicon sequencing, as well as developing detection methods for major oomycete species affecting soybean. What are your career goals? What are your plans for after your post-doc? My current career goals are centered around the ecology of soilborne fungi, either beneficial or pathogenic fungi. There is a vast field of research being developed using the novel microbiome approaches, but there is room for merging traditional concepts and methods with novel approaches to understand the complex interactions happening at the soil and root level. In terms of mentoring, I also look forward to teaching and mentoring students taking advantage of the research to provide them with the tools and the experience to thrive on science. Nowadays, it is important to support students and help them to communicate their science to different audiences, which is something that all of science is currently struggling to do. To accomplish these goals, I hope to become a professor to mentor and guide students providing opportunities like the ones that I have received. Mentoring is a great responsibility, but it can be very rewarding as you mentor people not only in science, but also on their professional values and the lab life promoting their wellness and success. What is your favorite fungus, and what do you like about it? One of the fist fungi that I was able to observe under the microscope was Cladosporium, the “shield” shaped conidia, it is one of the things that I will always remember and enjoy. It is a pretty simple fungus and it is present everywhere, but I crossed paths with this fungus a couple times. One of the first encounters was in plant pathology, since it was one of the main diseases on tomato and it was also used as model to develop early effector studies in fungi. Nowadays, some collaborators are trying to use it to control diseases on poplar. I am sure that there will be more interesting things that will come with the time about this fungus. Nonetheless, I must say that now that I got to work with ectomycorrhizal fungi, the boletes are nice and charismatic, there are few species in Populus that are very nice and they are making it to my favorite mushroom list, such as a Boletus coccyginus. What is your favorite thing/fact about mushrooms/fungi? Coming from a plant pathology background, it is really amazing the plasticity and subtle elegance that some of these organisms have to “infect” plants, the elaborate mechanisms that have evolved to do so, and it is really exciting to see this also present in the fungal symbiosis with plants, like the mycorrhizas. There is so much to discover and understand regarding the interactions between fungi and plants. This is one of my favorite topics and one of focuses of my career. 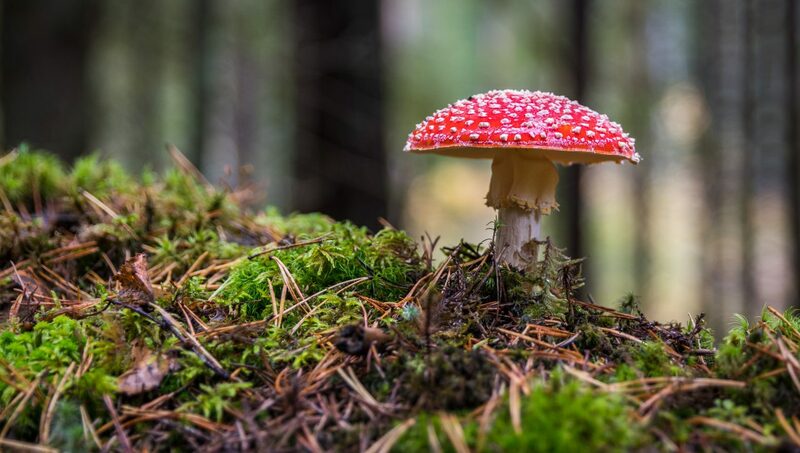 It is also intriguing the various interactions that fungi can have with different organisms across different groups or kingdoms, such as viruses, bacteria and insects. Do you have any funny or interesting stories about field or lab work? It was pretty cool to visit Washington and Oregon last year to sample mushrooms growing under poplar, you get to see really amazing forests and landscapes, and how the landscapes change quickly going from west to east, driving along the Columbia river and then across Mt. Hood. I have to say that it was an interesting and amazing field trip and great way to start working with mushrooms and fungi associated with Poplar. Work-life balance is really important for me, and my free time is dedicated to my family. My two little children are my main focus nowadays. In other times the geek inside me loved to read and watch movies like Lord of the Rings and all the related novels. When I go back home I enjoy fishing with my dad.